It's impossible to come to Queenstown and not leave without a souvenir. 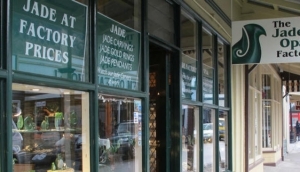 Queenstown Souvenir Shops are easily found at most of the city's major attractions. Or, browse the pretty, hidden streets off the CBD, to find something a bit special. Souvenir Shops in Queenstown offer some quirky mementoes, with which to remember your visit. The standard T-shirts, pens and car stickers, are pretty much everywhere, at most high street shops. Wander off the beaten, track, though, to discover something with a little more pizazz. There are some wonderful boutique art galleries and gift shops in the roads around Camp Street, or nip into O'Connell's if you like things more mainstream. Movie buffs can pick up some hard-to-find film memorabilia and Lord of the Rings trinkets at several Queenstown Souvenir Shops. Craft lovers should head for the art galleries and museums to find some locally-made artefacts. Buckingham Street in Arrowtown has a few interesting places to browse for that unique gift, as does the pedestrianised section of Queenstown's Ballarat Street.